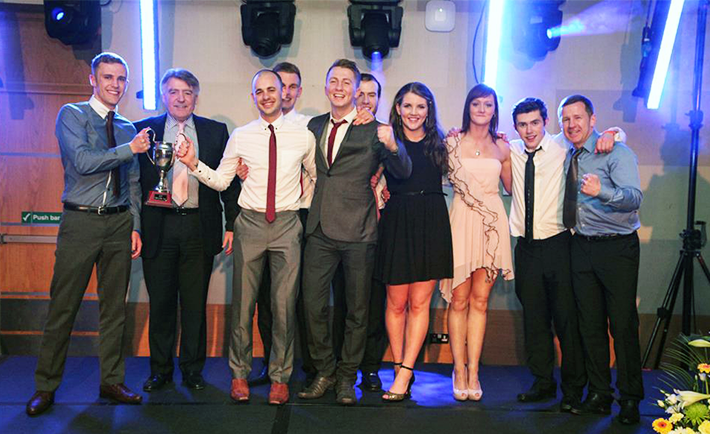 DCU Amateur Boxing Club was crowned Club of the Year at the DCU Sports Club Awards on Thursday night, less than two years after it was on the brink of extinction. All of DCU’s sport clubs and their members were recognised for their achievements on and off the field at the 21st edition of the awards. The ceremony, which is held in conjunction with the Club Life Committee, was held at the Crowne Plaza Hotel with over 300 people in attendance and was hosted by DCU Alumni Damian McEvoy. After a hugely successful year that culminated recently with the club winning the All-Ireland title, DCU Boxing Club took home the biggest award of the night – the club of the year, presented by Jim Dowling, DCU Deputy President. This follows on from the boxing club winning the most promising club of the year last year, despite the fact that the club was non-existent due to lack of funds when treasurer Terry Keegan took over in September 2012. There have been numerous successes for the DCU boxers this year with the standout being the recent All-Ireland title won at the Intervarsity National Championships along with five individual All-Ireland medals won over the same weekend. Also in a year of highs for DCU Boxing was the recent Darren Sutherland Cup, held in The Venue. The event was held in memory of Irish Olympic boxer Darren Sutherland, who died tragically in 2009. The Glasnevin university boxers put on a master class on the night to take home the title and cap off a wonderful year for the club. DCU’s ladies basketball team won the Team of the Year Award after recently completing a league and national intervarsity championship double. The recent basketball intervarsities were held in the DCU Sports Centre and saw the ladies team defeat city rivals UCD in the final to complete the double and officially take their place at the top of the Irish basketball pile. The award was presented by Siobhán Byrne, DCU’s Clubs and Societies Finance and Development Officer. The award for Most Promising Club of The Year went to DCU Badminton while DCU Weightlifting Club won the award for Communications and Marketing. Clubs and individuals can nominate themselves or be nominated by another club for the awards. Award winners are decided by a five-member selection panel consisting of staff from the Office of Student Life and the University.